There are no quick words to describe how beautiful and spiritual the Sacred Forest is. We sat on the rocks and listened to the spirits gather. 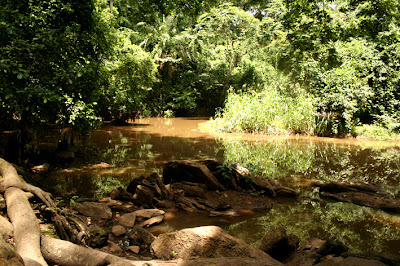 Monkeys played the other side of the river, as butterflies buzzed lazily about. Sango's wife was nearby. My wife? Where?! The one that fed me my ear? Jeremy i'm dissapointed...you could have taken photos of the monkeys playing on the other side. Would have been lovely to see. Nice photo. Thanks! Hi, I'm thinking of making a documentary on Sango's life, his wives and his legacy. Is it easy to get access to places like this and the other places in oyo you visited? Are the people co-operative?